A few weeks ago, I sat down to start writing a blog post on volunteering, including the many opportunities we as Carolina students have to volunteer. As I started researching the topic I came across a number of websites on the benefits of volunteering, and I noticed that on many of these websites, most or all of the reasons given on why to volunteer were focused on the personal benefits that can be gained through volunteering. For example, I found numerous lists of reasons why people should volunteer, and resume building, developing new skills, and networking were some of the most common (and sometimes only) reasons given. This surprised me, and ultimately rubbed me the wrong way. While these things are all great aspects of volunteering, I think that if our only reasons for volunteering are self-serving, this can be problematic. And thus, a new blog topic was born: how to be a more conscious volunteer! 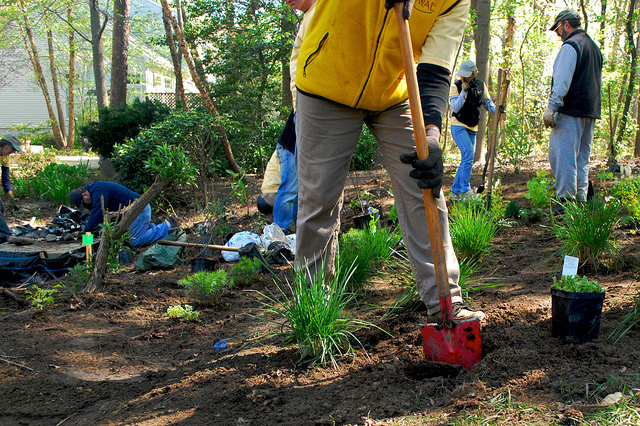 Photo (Volunteers planting a rain garden 3) by (Chesapeake Bay Program), Flickr Creative Commons. Volunteering can be a great part of one’s undergraduate or graduate experience at Carolina. I highly encourage everyone to get involved in whatever way(s) they are able. But as we embark on our journeys as volunteers, I would like to challenge us all to be conscious, mindful, and respectful throughout the whole process – from our reasons for why we volunteer to where we volunteer and what volunteer work we choose to participate in. Define for yourself why you volunteer. Maybe you volunteer because you feel strongly about a certain issue facing our society, or because you want to positively impact your community. Whatever your reason is (and I again challenge us all to identify reasons beyond things like resume building), remind yourself of it often. Let it serve as an inspiration for you. Do your research! Find an organization you’re interested in that does work in an area you’re passionate about, and volunteer with them as regularly as you’re able. Get to know the staff and clients. Find out what the organization really needs help with, and offer to help them with those projects that are perhaps not the most glamorous (like shredding paper, sealing envelopes, or filing). Talk to members of the community where you volunteer. Spend some time critically thinking about the volunteer work you are doing, and how community members perceive it. Is the volunteer work you’re providing something that the community feels is important to improving their community, or is it just something that someone outside of the community decided was a good idea? Volunteer as regularly as you can. While one-time, once per year service days are great, the more regularly you can volunteer with an organization, the more they will get to know you, and be able to really utilize your many talents to help further their mission. Be consistent and reliable. Whatever commitment you make to an organization to volunteer (be it weekly, monthly, four times per year, etc. ), honor it. Remember that the organization and the community it works with are counting on you to fulfill that commitment. Be knowledgeable about and respectful of the communities you’re volunteering in. Be aware of the disparities that exist in our society (racial disparities, income disparities, health disparities, etc.) and how they might be impacting the community you are volunteering with. Be aware of your privilege as a volunteer coming into a community, and how that dynamic might be impacting members of the community. For more information on different neighborhoods and communities in Chapel Hill, check out the Town of Chapel Hill’s website as a starting point. Don’t view your volunteering as a way to “fix” people and the communities they live in. When you go into a community to volunteer, consider the community members the experts. They know their community best, and they know what their community needs. When volunteers see their role as “fixing” a community, that mindset can be both disrespectful and harmful to the community and its residents. Instead, when volunteering in a community you’re unfamiliar with, think of yourself as a partner to community residents – be ready and willing to listen and learn. For more information, check out a previous Healthy Heels blog post that talks about savior complex and the effect it can have on communities. Spend some time volunteering in your own neighborhood. Think of ways you can positively impact the community you live in (trash pick-up, building a community garden, advocating for an issue in front of local government, etc.). Check in with your neighbors – see if you can get a group together to work on a project that will benefit your neighborhood and get some of your friends or neighbors together on a Saturday to work on a project that you all think is important for your neighborhood. Have fun, learn something new, and gain new perspectives! Next Article WORKOUT WEDNESDAY: Isotonic vs. Isometric Exercise: What’s the Difference? Great advice! I’ll definitely starting thinking more about why I choose to volunteer…and how it helps me grow as a person!